The What: PureLink's new HDTools HTX-U Series offers a full-featured Ultra HD/4K HDBaseT signal management system designed to simplify and enhance integration in a variety of conferencing, presentation, and home theater applications. The What Else: Available in 4x4 and 8x8 configurations, the HTX-4400-U and HTX-8800-U offer full HDMI 1.4b compliance to pass bandwidth content up to Ultra HD. All models support HDCP 2.2 over HDBaseT at resolutions from 480i to 4K at 30Hz to distances up to 330 ft. Flexible control options include IR, RS-232, and LAN for easy third party device networking. The Bottom Line: With integrated HDBaseT 5Play technology, the HTX-U Series converges video and audio signals, bi-directional control, Ethernet, and power into one cable for simpler installation. Well suited for a control room, board room, or entertainment system, the HTX-U Series delivers flexible HDMI to HDBaseT switching and plug-and-play connectivity between Ultra HD/4K sources and remote displays. 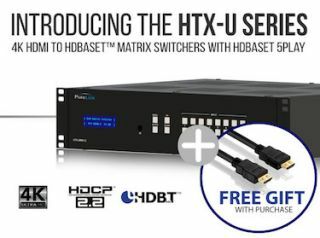 For a limited time, pre-orders of the HTX-4400-U or HTX-8800-U 4K HDBaseT matrix switching system will receive a free TotalWireHDMI cables.